My new gazebo garden gave me more fenced-in space this summer, so I just had to try growing a few new veggies, one of which was the Chinese Red Noodle Bean. This impressively-sized bean is also commonly known as the Yard Long Bean, Chinese Long Bean, Snake Bean, Asparagus Bean, and Pea Bean. 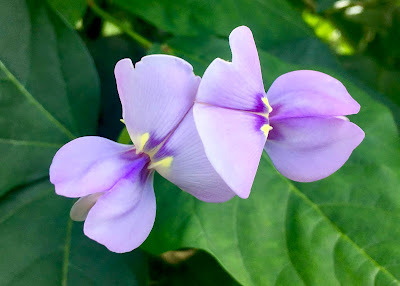 The botanical name is Vigna unguiculata subsp. sesquipedalis, and this legume is not actually a bean at all. 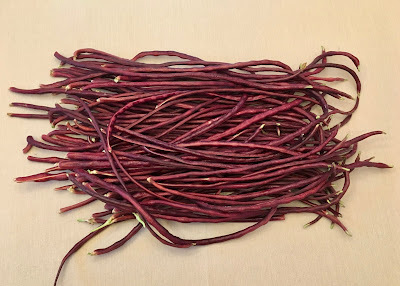 It is a variety of cowpea and in the same family as black-eyed peas. The heat-loving vines did wonderfully in my sunny front yard. I planted the seeds in June, and two months later they started producing beautiful, fragrant flowers followed quickly by the beans. The vines are vigorous and indeterminate (which means they keep growing and growing), ending up around 9 to 12 feet tall by the end of summer. Once they started producing, they didn't stop. I think I planted 8 seeds, and I ended up with crazy amounts of beans. I gave away piles of beans, as there were far more than we could eat along with the other veggies from our garden. 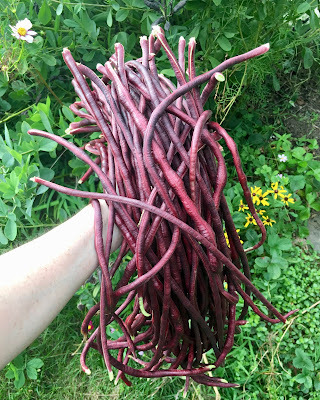 The beans were definitely better picked before they got too long and overly mature, before about a foot and a half. I enjoyed the mild flavor. Many think they taste more like asparagus, which is probably why a nickname is Asparagus Bean. This is a great bean for a stir-fry. It is highly nutritious, a good source of protein, Vitamin A, Vitamin C, folates, and other nutrients. 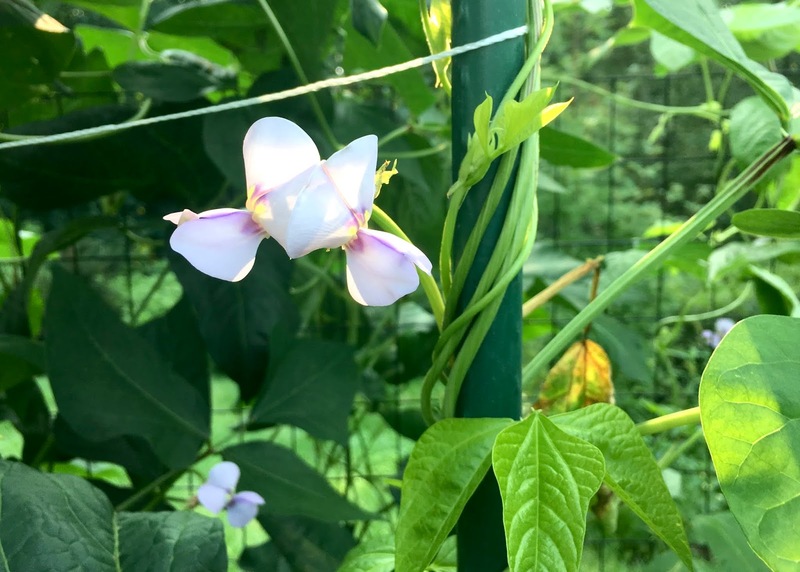 Yard Long Beans have extrafloral nectaries right below the flowers. 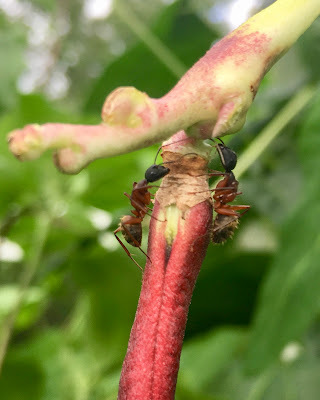 These nectaries secrete a sweet, carbohydrate-rich food that attracts ants. In return, the ants protect the plant from predators that want to eat it. Like me. I don't know if it was just my ants or what, but they were very good at their job. 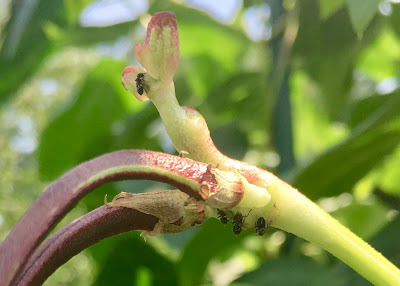 Every time I tried to pick a bean, the ants went crazy, racing up and down the bean. 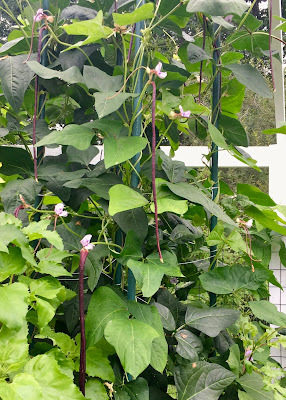 Imagine me, a vertically challenged woman who has to harvest these beans while standing on a step stool, trying to pick beans in this jungle of vines while constantly swatting ants off of me. I only got bit once, but still. Online others have said that they would just shake the bean and the ants would run away or fall off, but that didn't work with mine. I must have the extra-special guard ants. It is too bad, as these were great, productive beans. If anyone has a solution to fight off the ants, let me know. 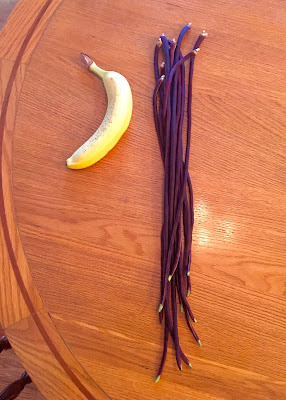 Until then I will be sticking to my more regular pole beans. One bite versus fragrant, productive and delicious? Sounds worth a try. It was more the frustration of having to constantly brush ants off of me so that I didn't get bitten. It took way too long to harvest them. Others seem to have a much easier time of it with the ants, though, so definitely worth a try. Huh, interesting! I don't have a lot of sun and I do have ants, so maybe it's not a good crop for me. But I will put this in the "maybe try this in the future" category. They certainly are lovely and the harvest is impressive! Thanks for the info! Others don't seem to have nearly the same amount of issues with their better-behaved ants, so it might be worth a try. Definitely very productive! That is quite the harvest! Much better than when I've tried to grow this plant, but I did end up neglecting it half the time and not giving it the space it needed. Fortunately we didn't run into any ant problems. I love your gazebo garden! Thank you! It actually gets more sun than my regular veggie garden does, making it an excellent spot for those heat and sun loving veggies. Its also a great spot for flowers, so a mix it is. It would be an awesome screening plant! My ants were especially crazy, but others seem to have better-behaved ants, so I might just be lucky. They are good beans. I hope others have an easier time of it harvesting! 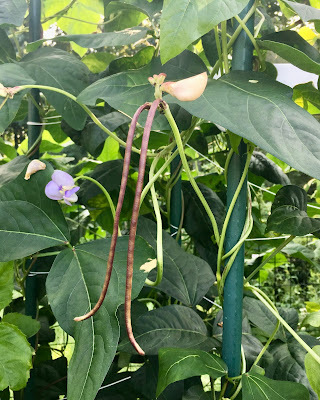 I've never seen such beans (or cowpeas)! They certainly are a novelty and would probably capture a ribbon at the fair, entered under 'Unusual Vegetable' or some such. ;) A pity about the ants. I love peonies and tolerate ants, but picking them isn't like picking beans. I had some that were easily 2 feet long by the time they were going to seed. A fun plant to grow and see. Wow, those are some amazing beans! I can see you fighting off the ants! Can you hit them with a very strong spray from the garden hose, immediately before picking? Maybe wash them off at least temporarily to give you a chance. I thought of that, but I didn't have a hose that reached this garden. Possibly if I grew them in my regular veggie garden... I can't find any reports online of people having this much trouble with the ants staying on the bean, so my ants might be special. Those are fascinating, and I love that they taste like asparagus. 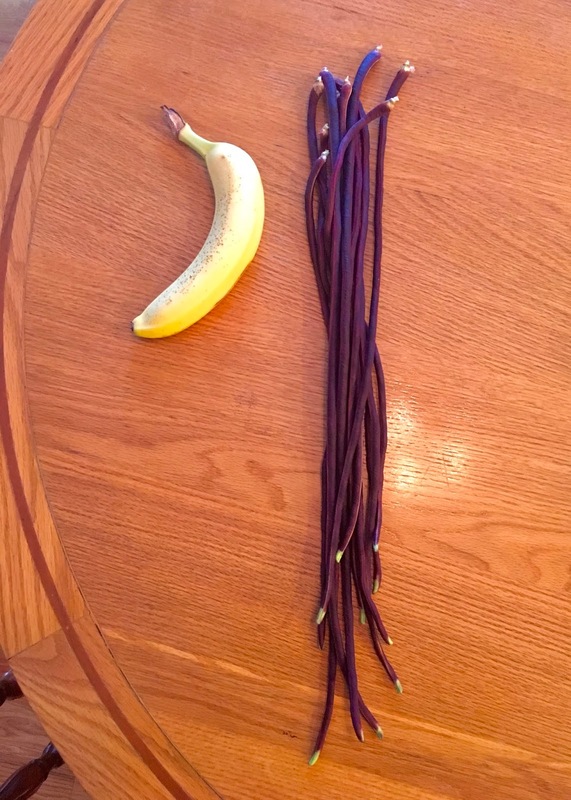 I would say it was a mix of bean and asparagus. A good taste. I've never grown long beans, but I did buy them once at a local farmers market, and they were delicious. They're on my list of plants I'd love to grow someday (even with the risk of dealing with guard ants)! You might have better luck - I think I just have crazy ants!